Home » News » A Merry Bear to You! 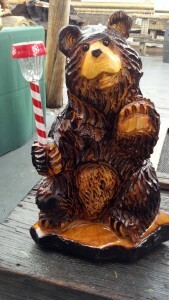 If you had a chance to view my latest post, Buzzing Away, you saw the photo of me carving a bear for a chainsaw sculpture demonstration at Knotts Berry Farm! Well, he's finally finished! Take a look!